We traveled to so many places. First, it was the city of Alajuela, where we stayed with our host families. There, we would simply walk to our destinations with the help of a map or be driven places by our host families. We explored all of the downtown by foot, and found many interesting things while we walked. As we did, I saw a sign that said “Soda” on a shop front, and asked about it. I was told that a soda is a mini-restaurant where you get in, get your food, and get out. Their food is like mom’s cooking, too! I found that to be a really neat part of the city. Once or twice we took taxis, which was a crazy adventure. Super cheap, but the driving was kind of scary. The city buses were fun! Although you had to tell the bus driver where you wanted to get dropped off, or else they’d drive on by. Besides Alajuela, we ventured to other towns and cities by van. 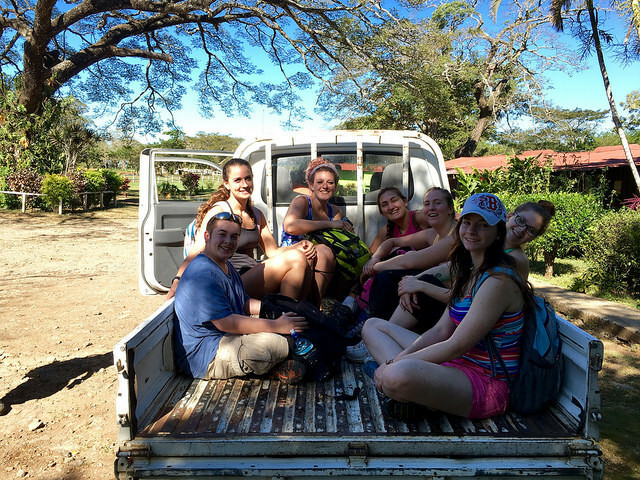 A tourist van, to be exact – because tourism is very popular in Costa Rica and they have vans with professional drivers. We spent a lot of time on the road, going from place to place. We drove up to the top of the valley that overlooks Alajuela, we drove to a coffee plantation, we drove to a farm that made milk and cheese, and we even drove to another country, Nicaragua. As we went farther from Alajuela, things got different. Especially in Nicaragua. Nicaragua is right above Costa Rica, and it is just as pretty yet more touristy than Costa Rica itself. It was tougher to travel in Nicaragua than Costa Rica, due to all of the security at the borders. And, because you couldn’t go 5 minutes without someone trying to sell you something. What I didn’t like about Nicaragua, was how everything was monetized. I didn’t like having to pay to go to the bathroom, or to pay to leave the country. I also almost got ripped off by people at the mall too, which made me mad. I liked both countries that we went to, but I’d prefer Costa Rica over Nicaragua any day. It’s just easier to travel in Costa Rica. The country itself is only 2/3rds of the traveling experience. That other third comes from the airport. In an airport, so many things can happen or did happen. One of our students managed to lose her ticket for the first plane to Costa Rica! And one of our flights were delayed and we just barely managed to catch our next one. Lastly, my bag was almost too heavy to bring on the plane when we left Costa Rica. It was exactly 50 pounds! My favorite part of traveling though, would be the horseback riding. It was great!